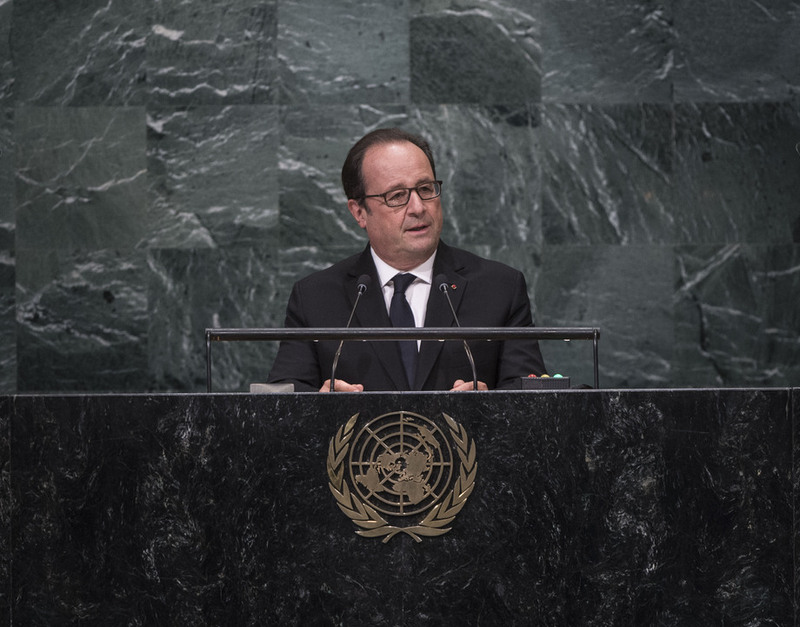 FRANÇOIS HOLLANDE, President of France, urged Member States to do everything possible to implement the “historic” Paris Agreement. “Despite the significant nature of this agreement, we have no time to lose,” he warned, emphasizing that the last two years had been the hottest ever on record. The agreement would only come into force if it were ratified by at least 55 per cent of countries. Encouraging Member States to ratify the agreement, he commended both China and the United States for doing so, adding that “nothing would have been possible” without their commitment to decrease carbon emissions. “The appeal I want to make to you here is an appeal for Africa,” he said, pointing out that the continent was full of potential, but impeded by insecurity, mass migration, desertification and drought. The fact that two thirds of Africans currently lacked access to electricity was an injustice. While noting that Europe was devoted to providing millions of Africans such access, he stressed that he was not calling for solidarity, but rather for a “mutual investment” that would benefit all. France would continue to remain committed in Mali where it would uphold its responsibilities. It was critical to avoid the situation where terrorist organizations could take control of countries and destabilize entire regions, as demonstrated by the actions of Boko Haram and Al-Qaida. “Let’s be clear. The security of Africans must come from Africans themselves,” he said. Therefore, it was vital to equip armies so that they could organize themselves in a free fashion. On Syria, he said that the tragedy would be viewed as an international disgrace if not ended quickly. Aleppo was a “martyred city” where thousands of children had died in bombings and where chemical weapons had been used. “I have one thing to say: it is enough,” he stated, emphasizing that the regime was responsible for the recent failed ceasefire. Foreign supporters must pressure the regime to end the bloodshed or they would also bear responsibility. Meanwhile, the Security Council must not be a “theatre for fools”, evading responsibility. France would continue to request a ceasefire and assure the immediate delivery of humanitarian aid to Aleppo and other cities. It would continue to call for political negotiations to resume and for the punishment of those who had used chemical weapons. That kind of intervention would also mean that Iraq could be free from the threat of Da’esh that occupied its territory now. The alternative would be continued chaos and division. Turning to the matter of Israel-Palestine, he said the objective was to meet by the end of the year for a conference where both sides could negotiate. As well, Member States should do everything possible to implement the Minsk agreements for a peaceful outcome to the conflict in Ukraine or risk more violence, and perhaps even a war. On terrorism, he underscored that no country could say it was immune. Terrorism prospered from open conflict. In the face of that danger, France would continue to turn to the United Nations. “We cannot just talk about solidarity when a terrorist attack happens to a friendly country,” he said, stressing that France would continue to reject populism and the notion of pinning different people against each other.